Svensson screens are constructed in a very special way, using pure aluminium and clear polyester strips. Both sun radiation from above and IR radiation (heat) from below are effectively reflected, giving the screen its tremendous cooling and insulating properties. 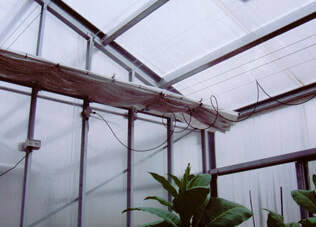 Svensson screens easily lower the ambient temperature inside the greenhouse 5 to 8ºC during warm days and reduce plant temperatures by up to 12ºC. 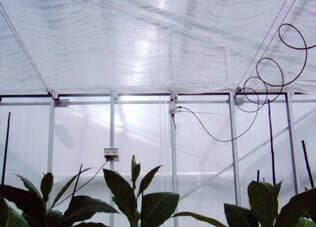 During winter the screens act as an insulator increasing night time plant temperatures by up to 6ºC. At the same time the screens save up to 70% on fuel expenses. In order to achieve the desired effect with a Svensson screen, it should be installed so that it may be moved later. In this way, it can be changed according to the weather. When the sun is not intense or when the sky is overcast the screen should be withdrawn to allow all the available light to reach the crop. Return on investment for a movable Svensson screen varies from two to three years, while the lifetime of a Svensson screen can be up to 10 years.